Steve Ditko, the creator of Spiderman and Doctor Strange, passed away on June 29. When I was a kid I had a pretty sizeable comic book collection that included the first couple dozen Doctor Strange adventures, published by Marvel and illustrated by Steve Ditko. At the time I had no idea of becoming an artist myself, but from today’s perspective, I realize my early interest in comics was all about the artwork, which I studied intently. And no artist’s work fascinated me more than Steve Ditko’s. 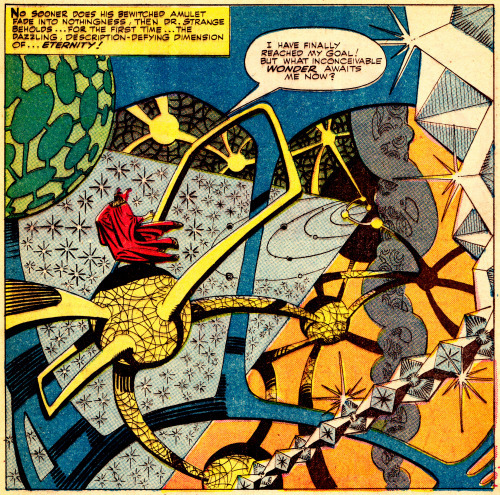 Ditko’s imagery operates on multiple levels. His characters all have a sinuous Expressionist quality that’s completely different from the more stoic attitudes of the characters rendered by his peers. Even at a young age, I knew his work was way out there. Before dreaming up Doctor Strange, Ditko illustrated dozens of short stories in comics with titles like Amazing Fantasy, Journey into Mystery, and Tales to Astonish. These books were packed with weird aliens, dark magic, and gateways between dimensions, all of which are key elements in Doctor Strange’s enchanted worlds. Dr. Strange’s spells invoke supernatural forces that conjure places and states of mind you can step right into. Which is what artists, writers, and musicians do all the time. So bon voyage Steve Ditko, and thank you for weaving the many wondrous images that helped me find my own personal set of keys to the doors of perception.